Our school bus operating locations are based in Brampton, Mississauga, Leamington and Simcoe County, Ontario. Each of these branch locations have on-site management, dedicated bus fleets maintained by our expert technicians and a team of professional school bus drivers. Our team and fleet of buses have the area covered – we serve both school districts and private customers alike. Whether you need a shuttle bus for your company special event, or want to rent a bus for your private group trip – contact us today. 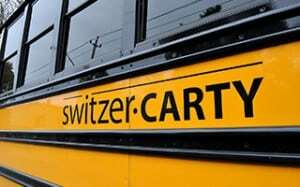 At Switzer-Carty Transportation, we have the right buses for your group needs and services delivered by the best team of drivers and operations management in Ontario.